The 2009 Pontiac G8 GXP is the final, ultimate Pontiac. 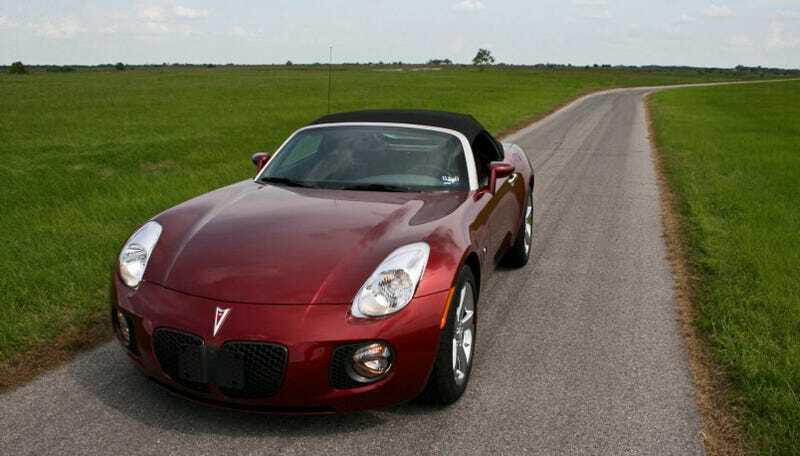 The 2009 Pontiac Solstice GXP is neither. After civil wars, multinational organizations like to engage the various parties in a truth and reconciliation commission to bear witness to what happened with the hopes of avoiding a similar occurrence. If the "New GM" is going to succeed, the company needs to understand where the "Old GM" went wrong. This isn't about unions or an addiction to SUVs. This has nothing to do with the Chicken Tax or the Interstate Highways Act. This has everything to do with a company's ability to build a gorgeous car with a peach of engine that's not a particularly good car. It would be a Pontiac only, shared with no other brand. It would sell for about $20,000 for a naturally aspirated version and just under $30,000 for a supercharged one like the show car. It would be basic, with a manually operated softtop. So close and yet, actually, not that close at all. The Solstice GXP, despite its engine, is a car that should probably be driven slowly. It'll give you more time to enjoy what GM got right. The 2.0-liter turbocharged ECOTEC engine is wonderful. There's so almost no lag and, though short on cylinders, it delivers the power my right foot wants. Plus, driven slowly enough, you don't notice how confused the five-speed automatic transmission this wonderful powerplant is paired to gets at the slightest hint of an acceleration change. While lightly trotting teenagers and others with poorly-supported jaws openly gawk at the curvaceous body, which seems to be made up entirely of eye-pleasing curves. Helen of Troy incarnate in well-shaped metal launching a thousand comparisons to Beyonce, Salma Hayek, and Marilyn Monroe. Stop long enough for anyone to look more closely and someone might notice the standard GM square radio stuck unevenly in the rounded-off dash or the slowly eroding gasket that runs along the top of the windshield curiously designed to tear each time you put the top up. At under 30 MPH the GXP has all the traits of a well-engineered RWD car. It stays Tina Fey-flat around corners and steering is sharp and turn-in is quick. Get above 60 MPH and the car, top up or down, begins to become uncomfortably unstable. Cornering at high speed, with the traction control off, and suddenly grip evaporates. The expectation is of controllable oversteer. In reality, the car merely starts to go in the direction of momentum and then, just as the tires catch, it downshifts again so any correction you just made becomes invalidated. True to the desire of Lutz, it has a manually-operated soft top. But it's so weirdly complex it's hard to call it simple. In order to open it you have to, first, put the car in park. Second, hit the "trunk release button." Third, reach up and release the handles. Fourth, reach out and push top backwards. Fifth, tamp down the top so it fits into the trunk space. Sixth, slam the trunk. Seventh, really slam it, put some weight into it. It's basically the same to put the top up, except you also have to snap the rear of the soft top into place. The concept was right, but too many of the steps to get it to reality were the wrong ones. Too much planning was sacrificed for the benefit of the concept. Nothing fits quite right. Nothing feels quite right. It's not a pure Pontiac, as anyone driving a Sky can tell you. I been in the right place but it must have been the wrong time. I'd of said the right thing but I must have used the wrong line. I been in the right trip but I must have used the wrong car.